Oh my goodness, I am salivating! I’m about ready to break my diet with this! my daughter-in-law makes this …never any left! I should do that next time. It was a little weird feeling in my mouth. It looks so yummy and I just gained a pound looking at it! 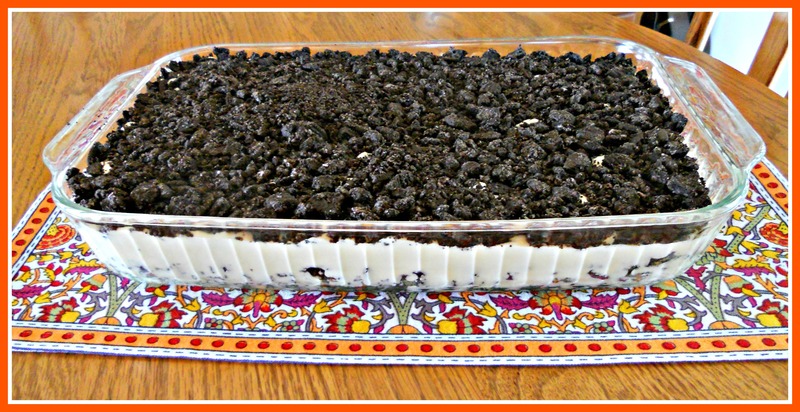 anything that starts with Oreos and doesnt require baking is a winner in my book! thanks for this easy recipe! Looks yummy! It’s a shame I’m back in my diet on Monday!!! Now that looks dirt delicious!!! That would be fun to serve on Halloween!!! I shall have to try it!! Nuts! None left to bring home? Glad that they liked it so much, but gee, none for you just isn’t quite right somehow. For Halloween you should do this again, but include a few gummy worms. Guess you’ll have to make another one just for you. With gummy worms or butterflies. Nuts.com has got a huge selection of gummy-everything! Love that this recipe is so easy and I’m sure it’s delicious too! Oh my, that is one dirty cake! Love it! By the way, I love that placemat! This looks AMAZING! I must try it!!! Looks yummy and pretty easy. This is one of my kids favourites, we hide gummy worms in it. I’ve got to make this for my son who loves everything cookies ‘n cream! Thanks for sharing! I loves your dirt cake I wish I can have a piece .I have a sweet tooth and this would be very satisfactory for my tummy. Here is my version http://the-room-mom.com/dirt-and-worms/. I just made this and put it in the fridge. Does it firm up? The filling seemed a tad runny…. Can you actually slice it after or just sort of take a big scoop? Pass me a big cold glass of milk!